Home | Style | Theatre | The Hook Star Jamie Sives Talks Miller, Liverpool and THAT TV show. The Hook Star Jamie Sives Talks Miller, Liverpool and THAT TV show. The wait is over. 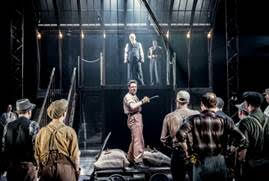 The Hook, a shelved screenplay written by the great Arthur Miller sixty years ago, is about to open before expectant audiences at The Liverpool Everyman from July 1st until July 25th. News of a "brand new” Miller play being performed sixty years after it was first penned has been the source of much anticipation since the announcement that it is to be coproduced by Northampton’s The Royal & Derngate and Liverpool’s Everyman & Playhouse theatres, with acclaimed Director James Dacre at the helm. The story behind The Hook is typical Miller, that of a close knit community grappling with a world of crime and punishment, of changing industry and an influx of immigration from abroad into the docks of New York during 1950s America. It was first written as a screenplay in 1949, with Eli Kazan – he of the legendary On the Waterfront – set to direct. However, with Reds under the Bed paranoia sweeping America, the authorities who then included the big movie studios, insisted that Miller made Communists the villains of the piece, rather than the gangsters actually controlling the Brooklyn docks. Miller refused and the project was shelved and he went on to write A View from the Bridge – also set in the New York docklands – in 1955, only then in 1956 to find himself in front of the House Un-American Activities Committee (HUAC), and being ordered to “out” any Communists working in the Arts that were known to him. Integrity was something of a byword for Miller and again he refused, later severing all contact with Kazan after the director pointed his own accusatory finger at eight former colleagues in the movie industry. In classic Miller style, Marty Ferrara, the protagonist of The Hook and who stands up to the corruption that surrounds him, is an honest, hard working longshoreman who has grown tired of what he is witnessing and decides to speak out. Jamie Sives is the first actor to ever play the part and in the centenary year of Arthur Miller’s birth; just two aspects which made it impossible to turn down. “To be the first to act out the words and develop a character that Arthur Miller pored over all those years ago is, in all honesty, incredibly humbling and I have to keep pinching myself to make sure it’s real. It really is quite something,” Jamie explained. 1950s America was a dangerous period in which to live and the fear of global Communism left many writers, actors and directors black balled and pretty much destitute. Unfortunately for Jamie, however, such were the timescales between being cast and rehearsals beginning, it is a period he had little time to research. “I did manage do some reading about the era, but nowhere near as much as I’d have liked, which is a shame because that period of history is fascinating. It must have been absolutely terrifying not knowing who to trust and it’s quite odd that, when you see the script for the first time, it seems so familiar because we’ve all seen films with Brando or Rod Steiger or Lee J. Cobb or whoever, all speaking in a vernacular we’re used to hearing. “It’s only when you actually start to work on these scenes in rehearsal that you fully appreciate acting them out is anything but easy, which then makes you appreciate even more the artistry of the writers and actors of the time; the scrutiny and pressure people, particularly artists, were being placed under by the government was immense because writers like Miller were dealing with these huge, complex issues that are still pertinent today – immigration, zero-hours contracts and the breaking up of industrial communities, as well as the corrosiveness of power. Jamie has been in some pretty notable TV series not least Secret Diary of a Call Girl and the first season of the mega-blockbuster hit, Game of Thrones. “Much to my shame, I hadn’t actually heard of George R. Martin or the books when I took the job on, but he is very much a modern day, American Tolkein. I bump into some of the actors that have managed to survive like Kit Harrington who plays Jon Snow and I don’t think anyone, other than maybe the producers, predicted just how incredibly popular it was going to be in the beginning. It is just the sheer scale of the thing and the fact that none of the characters are safe that makes it what it is.